We have spent the last few days in an eggnog haze. We adore eggnog and would drink an entire carton if we were allowed. Alas, we are not, our folks are so mean. We would also be happy to eat our weight in cookies, and might even be able to do that, as our mean folks were quite generous with the edible presents for us. On another note, our folks have updated the Desktop Freebies page with some new wallpapers. We had guests yesterday as a group of wild turkeys came a-callin’, strolling through our yard. Then they flew. Pictures at our Flickr page. This is one of our favorite things. 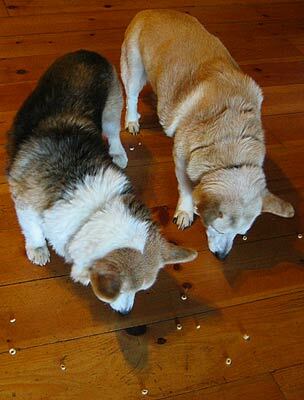 Cereal sprinkled on the floor so we can play vacuum.